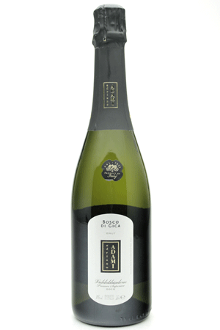 Straw yellow in color, this Prosecco is rich on the nose with excellent fruit, releasing scents of yellow apple and peach, with notes of wisteria and acacia blossom. Wonderful balance and elegance complement a pleasurably crisp spiciness. The palate holds delicious vein of acidity, displaying a crisp, savoury mouthfeel. Generous, lingering flavours nicely mirror the nose and achieve perfect balance. Ideal as an aperitif, but also a wine to be enjoyed throughout a meal. Excellent with fish, shellfish, and other seafood. Goes well with any light, delicate dish.